Ethan has been really interested in trying to understand days and time lately so I knew I wanted to make the introduction in our tot school lesson this week. 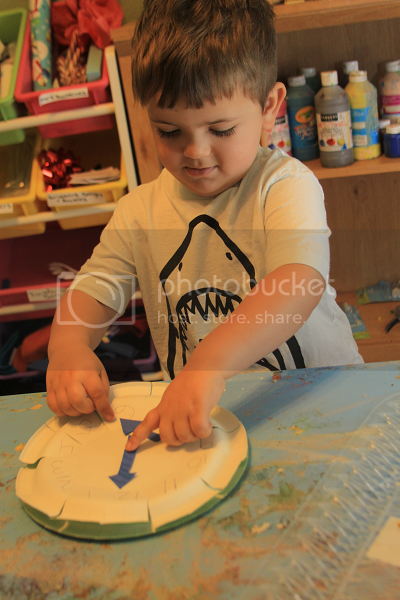 We did some fun activities for New Years Eve as well which Ethan loved, but his favorite trays this week were the ones about the days of the week. 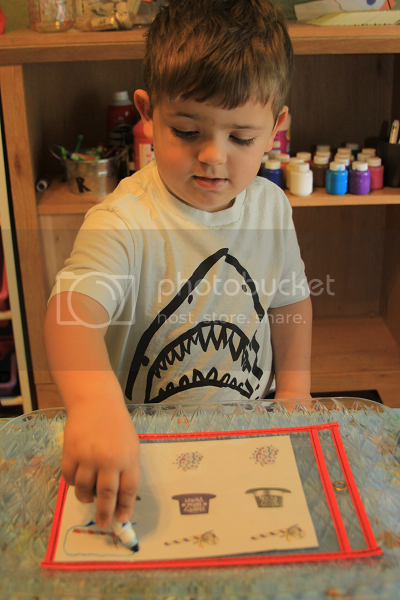 It's been a while since we did a magnet board activity and Ethan was really excited to see one return. 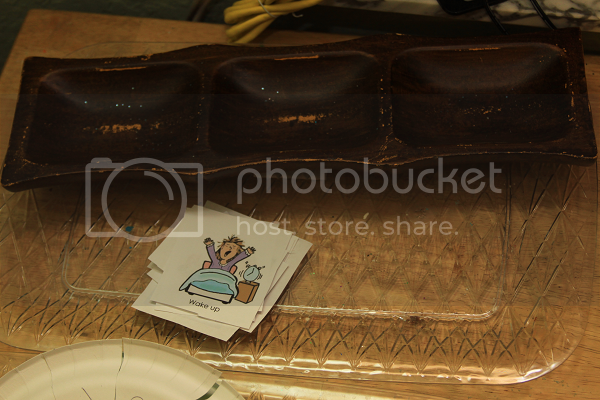 This was probably one of his favorite trays this week. 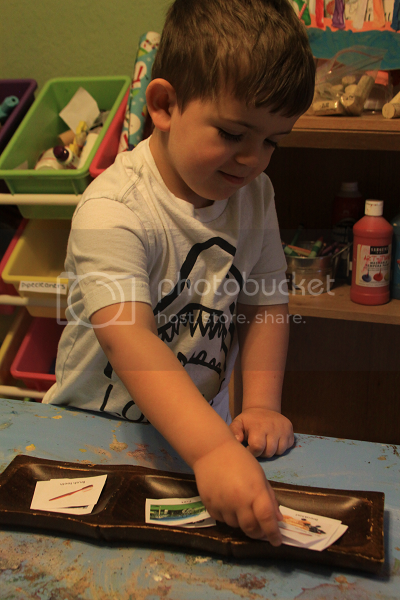 No matter what, he made sure we did this tray every single day. 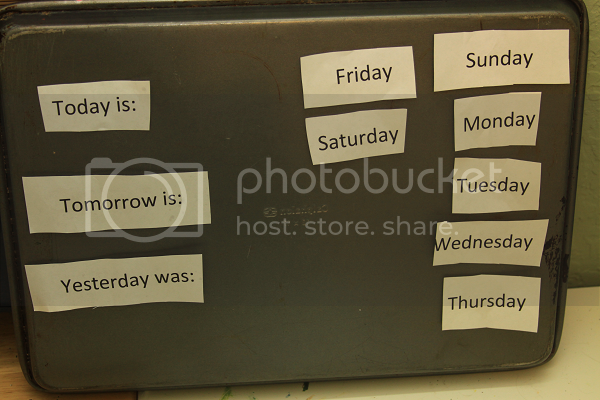 He's still at that point where he has to list all of the days of the week on his hands to determine which came before and what comes after, but he is doing great with this and is so proud of himself! 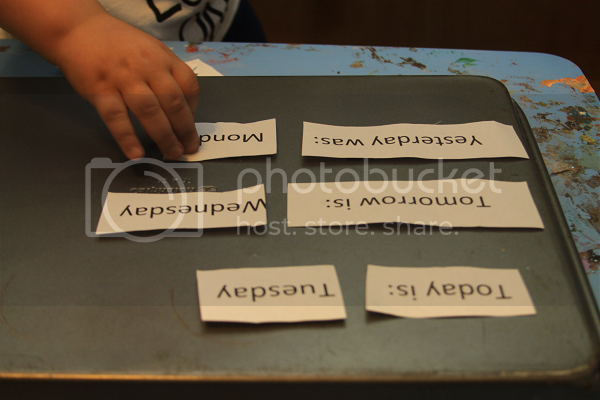 I printed out some little cards of different activities and Ethan got to sort them by morning, afternoon or evening. He did this one a couple of times but by the end of the week was a little bored with it. 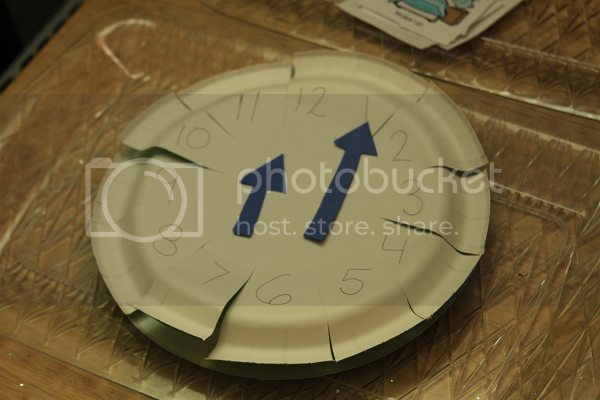 I made this clock out of two paper plates. 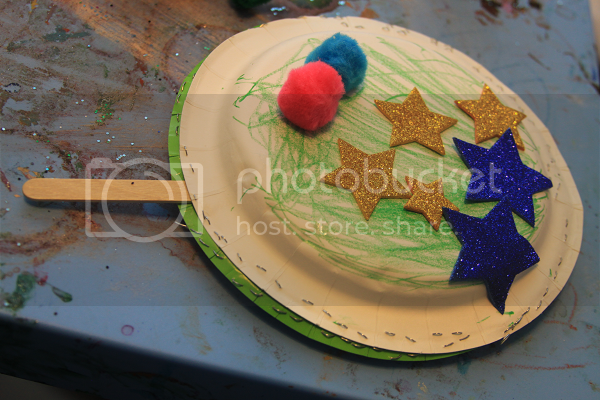 The bottom plate had the minute times so that Ethan could lift up the flap and see 5 was :25 and so on. This tray was confusing for him at first but he really started to get into it. 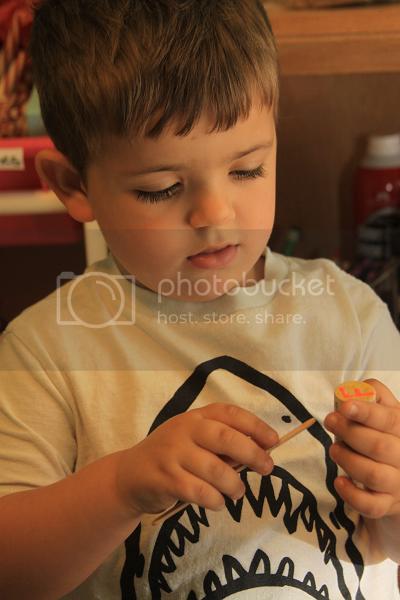 We would choose random times and Ethan's job was to make that time on the clock. One week really wasn't enough for him to fully understand telling time so we will be continuing this tray next week as well. This being my husband's busy time at work (to put it mildly), I didn't have a chance to finish putting together our tot trays for the week until about 11:00 pm on Monday night. My husband still wasn't home and I realized I was out of contact paper with no chance at getting any before the week started so I just used scotch tape. Here's to improvisation, right? 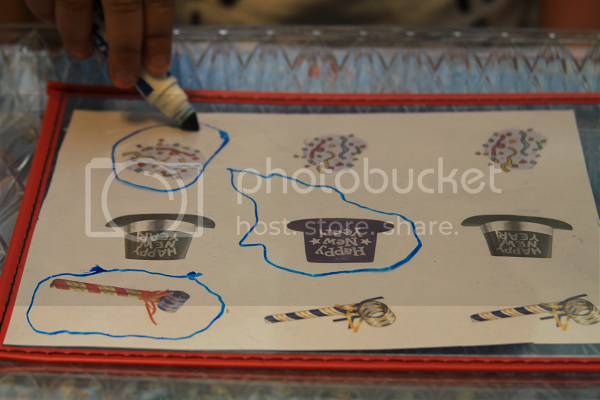 Anyway, the point of this activity was for Ethan to use the tweezers to fill the sticky paper with pompoms. 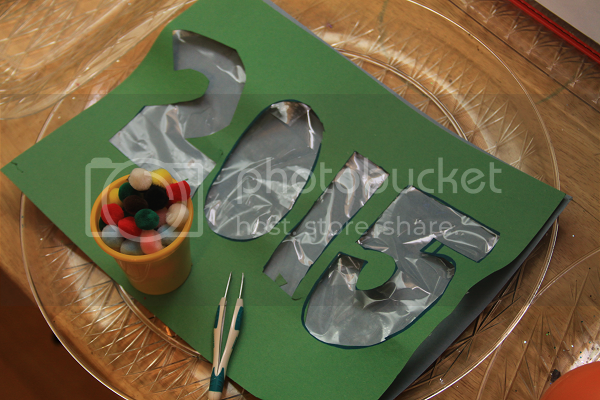 We talked about how it's now 2015 and he started off really into this tray but got bored after a while. 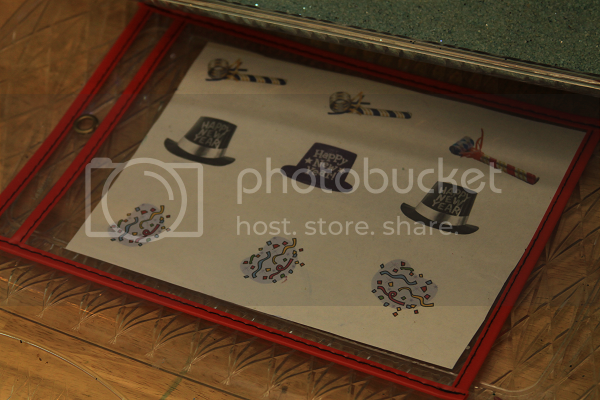 It took a long time to fill each number with tiny little pom poms and there were so many other trays he enjoyed more. 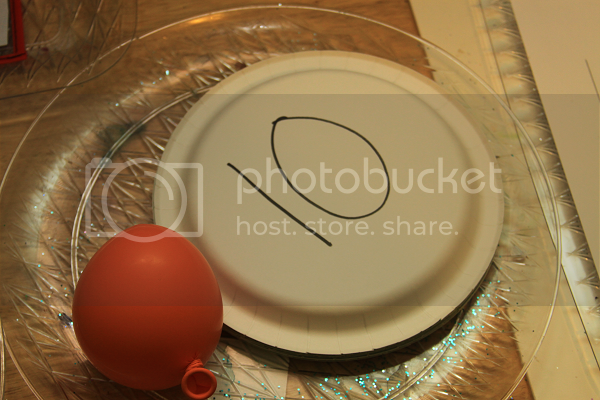 I filled a balloon with some dry rice to weight it a little and then labeled some plates with the numbers 1-10. I would call out a number and Ethan got to drop the ball onto the plate with that number. He really enjoyed this little game! By the end, we were tossing the ball in countdown style, from 10 to 1, and then he would exclaim "HAPPY NEW YEAR!" 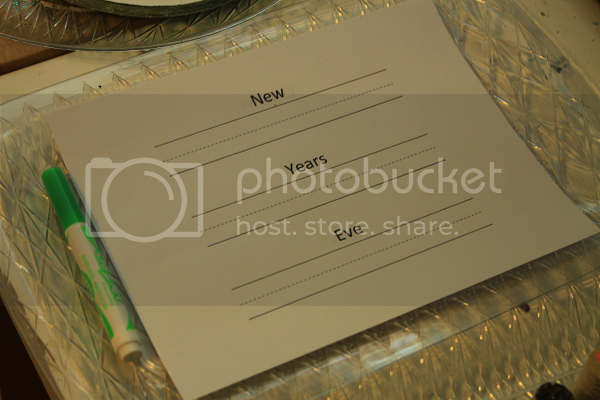 This was a fun little dry erase tray for Ethan to circle which New Years items were different. I wish I had printed more sheets because there were only so many times he wanted to do this one! Still, he really enjoyed it at first. 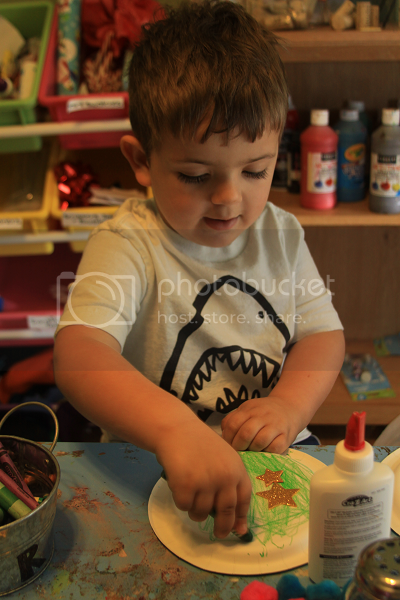 Ethan can write most of his letters by now but writing them on lines is another story. We're back at square one there. 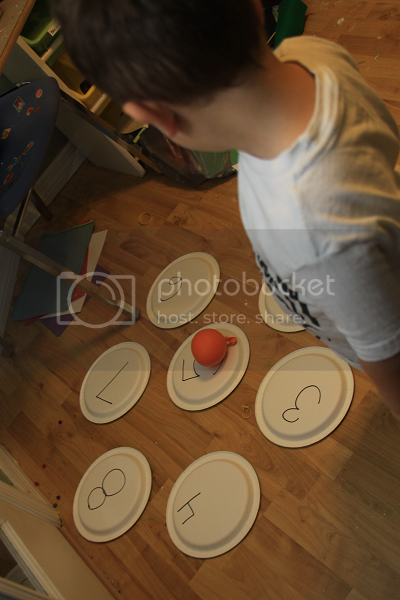 I thought this would be a fun activity to help him write short words and practice making his letters on the lines. 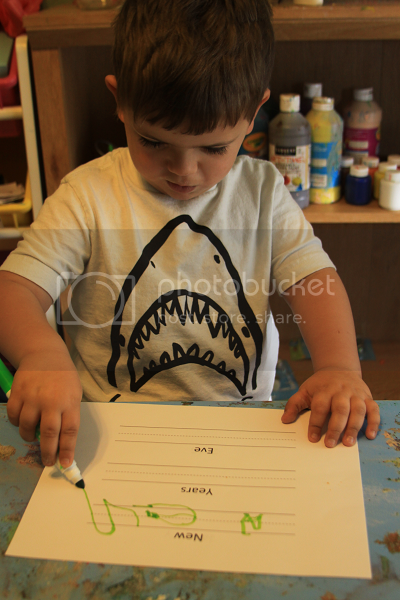 He got a little frustrated with this one as letters he can write with ease were more difficult to write when confined to a small space, but he really enjoyed the writing practice. 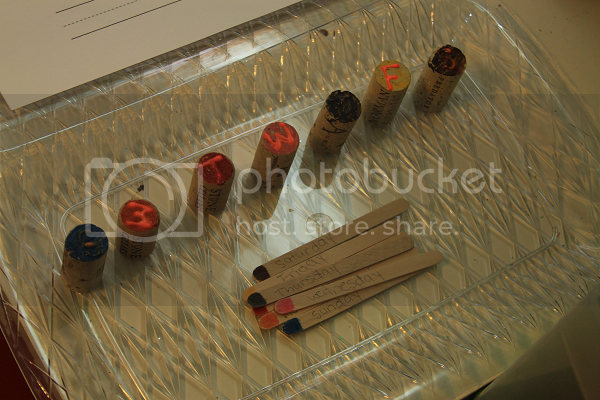 I'll probably add more writing practice trays each week. This was our most popular tray of the week which I didn't see coming. 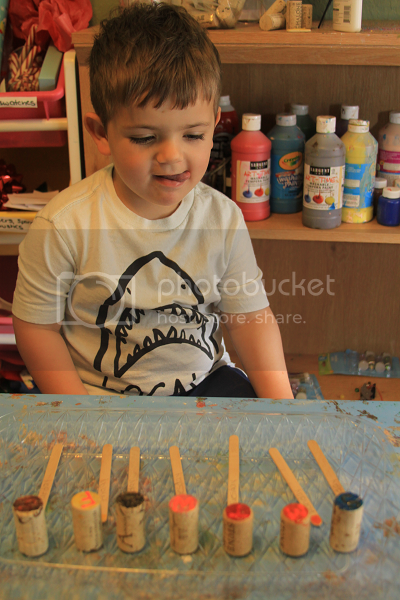 I had painted some corks each a different color and labeled them with S, M, T, W, T, F, S. On the tips of popsicle stickers, I painted each with a matching color and wrote out the full names of the days of the week. 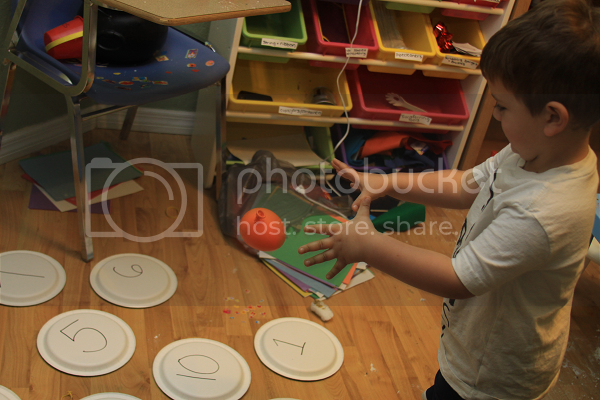 At first Ethan practiced matching the days by color and then by the first letter and, eventually, he learned the correct order for the days of the week and ordered them accordingly. 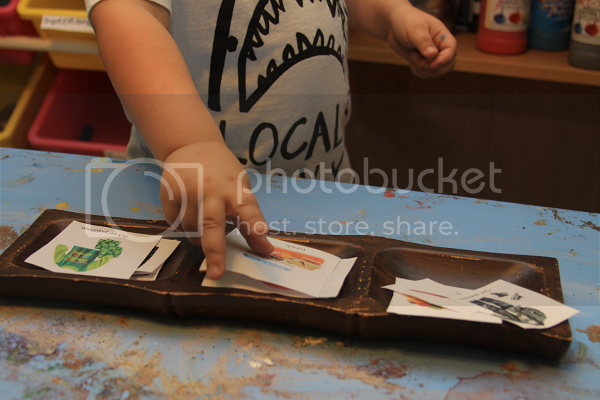 He really enjoyed this tray and couldn't wait to show his daddy how he learned the days of the week. 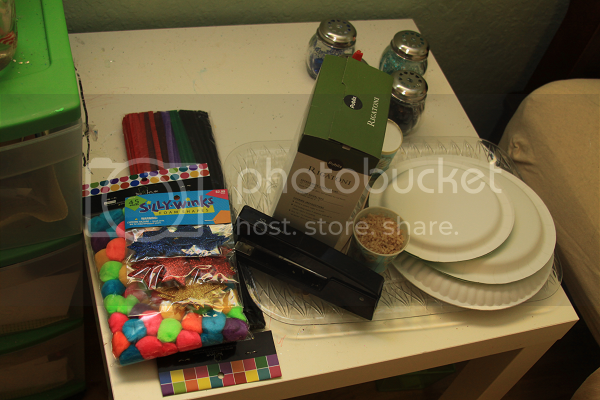 We spent a day making some New Years Eve noisemakers out of paper plates, dried rice and pasta and other art supplies. Ethan made quite a few and did so all on his own, minus the stapling which I insisted I help out with. 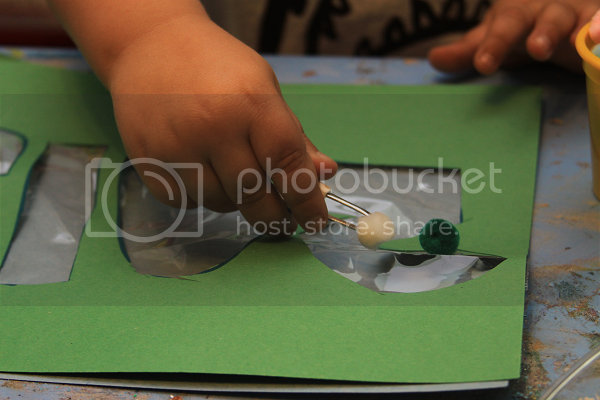 This was such a great independent activity for him to do and he really loved being able to do things by himself from start to finish, minus a little assistance with the stapler. I would be so happy and proud of myself if I just executed one of these activities! You are such a great, engaging, and organized mom! Ethan is going to be such a smart cookie!!! I got Lyla a same and different workbook and I'm so excited to use it with her!